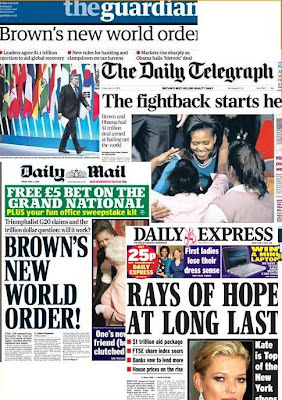 Politicana | UK & US Politics: Brown gets his best headlines ever? Brown gets his best headlines ever? The coverage of the G20 today seems to be overwhelmingly positive, with Gordon Brown appearing to be the big winner from the Summit. The Times leader writers believe that the ability of world leaders to show they could act together was crucial. "Divisions on how to deal with the financial crisis remain. Imbalances in the global economy lie uncorrected. But the G20 summit took important steps in improving the machinery for coping with the financial crisis. The mere fact of agreement will have expanded, in Gordon Brown's phrase, the oxygen of confidence in the global economy. To judge a summit primarily by its contribution to psychology may appear to trivialise a crisis that is widely compared to the Great Depression. Yet confidence is the crucial missing ingredient". "The world is better for having held this summit. The possibility of dangerous contagion is lower and useful progress has been made across a range of issues, from the need to keep trade free to IMF quota reform. But leaders must remember that the crisis, which started in the banking system, will not be resolved until the banking system itself is fixed. That is where they must turn their attention now." "The London summit was not, after all, a flop. More than that, the gathering of 20-something world leaders was a substantial success. It is true that, for all his diligent diplomacy, Britain’s Gordon Brown could not claim to have saved the planet. Yet historians will record the summit as the moment when a world in the throes of economic and geopolitical upheaval took a first, hard look in the mirror." "But if the jamboree has a legacy, it may be that the optimistic tenor of the leaders' exchanges goes some way to restoring battered global confidence. It is good to talk". "The brinkmanship and hyperbole of recent days has, at times, made this week's G20 meeting seem like a "make or break" summit for the global economy. The reality was always rather more subtle and less dramatic. This meeting was a stop on a larger journey, not the final destination. After yesterday's result, there are grounds for hope that we are, at least, on the right road". A second leading article on the G20 suggests that China's full participation in multilateral global fora may prove the most significant outcome. The Guardian welcomes 'tough talk' on tax havens, as long as a 'great blast of daylight' turns this into action. Its main 'London calling' leader notes that the G20 is now the world's premier decision-making forum, and highlights those issues which need to be addressed in future. "While the G20 was happy to give the IMF a fat chequebook, it was far too vague on reform of an institution that has rightly spent much of this decade in the doghouse. Most importantly of all, this economic crisis comes amid an even more important environmental one, and yet the communiqué treated the green agenda as if it was merely motherhood and apple pie, to be supplicated with a few mentions. This is not to dismiss the very real achievements of this week's meetings, but merely to point out ways the next summit must go further". "Its benefits might not be felt for a year or two. That will be fine for historians - who may well look back on 2 April 2009 as a crucial landmark in the journey back to economic health, giving credit to Brown for showing the way. But for a prime minister desperate to overturn stubbornly bad poll numbers, and facing election in 2010, that would be too late." Given that leaders spend much of their time in Downing Street pulling levers which have nothing at the end of them (ask Blair) the last few breathless weeks were an example of Prime Ministerial time spent constructively. As a result Brown's authority is enhanced. Peter Riddell in The Times does not "question either Mr Brown’s commitment and energy over the past few weeks or the substance of the pledges in yesterday’s communiqué", but notes that "for most British voters, the Budget in just under three weeks’ time on April 22 will be far more important". There is broad agreement that the summit brought important progress, but no economic or political miracles. But not everybody agrees. Daniel Hannan, despite the collapse of his Icelandic miracle model, remains an advocate of less regulation, not more, and so is sure that the G20 will make the global recession worse. What if Britain has to go to the IMF? Where will the narrative go from here? Obama arrives at Downing Street!